Hi, I am Erin Bonilla (pronounced "Bon-ee-a"). I am the wife of a military officer, the mother of 3 young children, and a PPA Certified Professional Photographer. I have heard that animals are an expression of God's love, and I thought that was a beautiful description of the role pets have in our lives. With our precious pets we laugh more, love more, and enjoy our lives more. We should return their love with as much devotion as they give to us. We like to take great care of them, to make sure they have the best food, the best care, and are as happy and healthy as they can be! They deserve to be remembered in the best way too, with a beautiful artistic portrait. My goal as a pet portrait photographer is to capture the personality and uniqueness of your pet in a beautiful portrait. I want you to enjoy the portrait for the rest of your life, long after your pet has crossed the rainbow bridge. I had a yellow lab for 13 years, his name was Jive and he was one of the most important parts of my childhood and growing up. I wish I had portraits of him that show how obsessed he was with water, and how much he was totally devoted to me. I know that if I did, those portraits would bring joy to my life every single day. I want to provide that for people who still have their pets with them now. In 15 years, how do you want to remember your companion animal? What is it about them that makes them who they are? How do they bring joy to your life? Please call me if you are interested in a pet portrait. I would love to help bring joy to your life for years to come with images of your beloved pets. 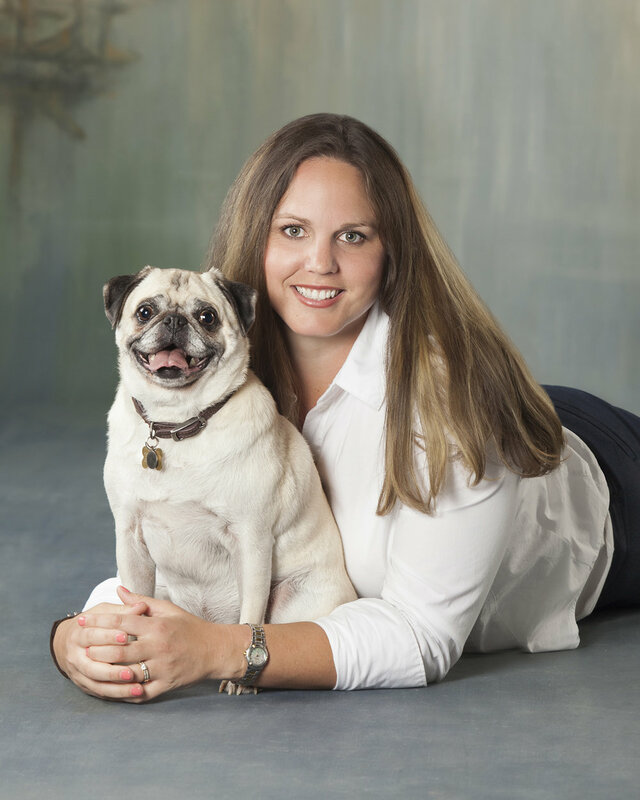 Your pet will feel at home in the only dedicated pet portrait studio in Hampton Roads. Specializing in pets allows me to design my studio to accommodate my clients and their pets. That means that I take measures to ensure their safety and comfort. All of the props are pet sized and some are designed for pets! I have a whole box that is just hats! We are the pet portrait experts and we can work with all kinds of animals of varying temperaments and levels of obedience. We only use positive reinforcement and are never harsh or pushy with the animals. With pet portraits, patience is key. Pets Only! This allows me to focus all of my attention and energy on making my studio the most comfortable for pets, and creating successful portraits with any pet. I will also do family portrait with you pet though! Professional animal handlers are available to assist with your portrait. They are dog trainers, and vet techs who know how to pick up an animal, how to read their body language and make them comfortable. Together, we make the magic happen. Even with difficult animals. And none of them sit still. Corijona helps Eloise get in the right pose for her close up. Upon entering the studio you will enjoy a gallery where my award winning artwork is on display, inspiring visions for your own custom artwork with your pet as the star.